Shortly after my marriage I had bought a connection in the Paddington district. Old Mr. Farquhar, from whom I purchased it, had at one time an excellent general practice; but his age, and an affliction of the nature of St. Vitus’s dance from which he suffered, had very much thinned it. The public not unnaturally goes on the principle that he who would heal others must himself be whole, and looks askance at the curative powers of the man whose own case is beyond the reach of his drugs. Thus as my predecessor weakened his practice declined, until when I purchased it from him it had sunk from twelve hundred to little more than three hundred a year. I had confidence, however, in my own youth and energy and was convinced that in a very few years the concern would be as flourishing as ever. For three months after taking over the practice I was kept very closely at work and saw little of my friend Sherlock Holmes, for I was too busy to visit Baker Street, and he seldom went anywhere himself save upon professional business. I was surprised, therefore, when, one morning in June, as I sat reading the British Medical Journal after breakfast, I heard a ring at the bell, followed by the high, somewhat strident tones of my old companion’s voice. I glanced down at the new patent-leathers which I was wearing. “How on earth –” I began, but Holmes answered my question before it was asked. “In an instant.” I scribbled a note to my neighbour, rushed upstairs to explain the matter to my wife, and joined Holmes upon the doorstep. “Your neighbour is a doctor.” said he, nodding at the brass plate. The man whom I found myself facing was a well-built, freshcomplexioned young fellow, with a frank, honest face and a slight, crisp, yellow moustache. He wore a very shiny top-hat and a neat suit of sober black, which made him look what he was — a smart young City man, of the class who have been labelled cockneys, but who give us our crack volunteer regiments, and who turn out more fine athletes and sportsmen than any body of men in these islands. His round, ruddy face was naturally full of cheeriness, but the corners of his mouth seemed to me to be pulled down in a half-comical distress. 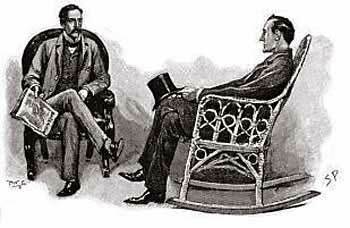 It was not, however, until we were in a first-class carriage and well started upon our journey to Birmingham that I was able to learn what the trouble was which had driven him to Sherlock Holmes. “I used to have a billet at Coxon & Woodhouse’s, of Draper Gardens, but they were let in early in the spring through the Venezuelan loan, as no doubt you remember, and came a nasty cropper. I have been with them five years. and old Coxon gave me a ripping good testimonial when the smash came. but of course we clerks were all turned adrift, the twenty-seven of us. I tried here and tried there, but there were lots of other chaps on the same lay as myself, and it was a perfect frost for a long time. I had been taking three pounds a week at Coxon’s, and I had saved about seventy of them, but I soon worked my way through that and out at the other end. I was fairly at the end of my tether at last, and could hardly find the stamps to answer the advertisements or the envelopes to stick them to. I had worn out my boots paddling up office stairs, and I seemed just as far from getting a billet as ever. “And now I come to the queer part of the business. I was in diggings out Hampstead way, 17 Potter’s Terrace. Well, I was sitting doing a smoke that very evening after I had been promised the appointment, when up came my landlady with a card which had ‘Arthur Pinner, Financial Agent,’ printed upon it. I had never heard the name before and could not imagine what he wanted with me, but of course I asked her to show him up. In he walked, a middle-sized dark-haired, dark-eyed. black-bearded man. with a touch of the sheeny about his nose. He had a brisk kind of way with him and spoke sharply, like a man who knew the value of time.